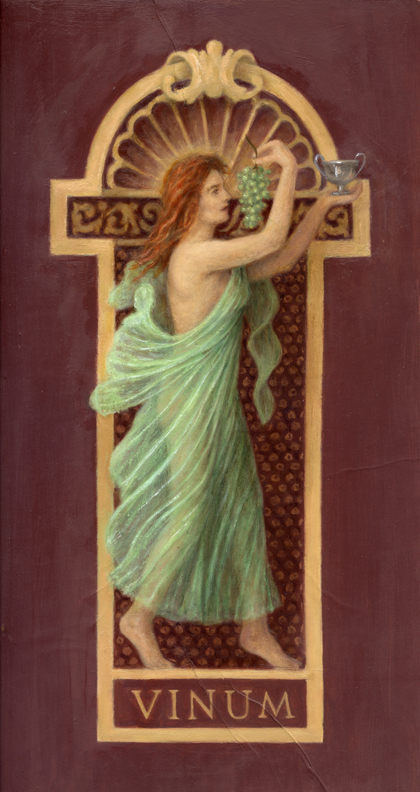 This was an exercise I set for myself based on one of the four allegorical figures in the Hall of the Doges in the Davenport Hotel in Spokane,Washington. I took the general idea but recreated the figure using a model. The kernel idea for the picture that became Reflections came about in the Spring of 2001. The painting, Janice With an Amphora had been installed in the Marie Antoinette Ballroom of the Davenport Hotel in her memory, since she had so much to do with the decor treatments we had together come up with for the renovation of that room. She had died before seeing its completion. Looking at it one day it occurred to me that I hadn’t quite gained my object. I had been seeking a way to convey a female gracefulness and dignity in a timeless way, hence the simple Grecian tunic (or chiton). There was something I had not attained. The garment was really a studio prop, not something one would be able to wear in public here and now. This way of thinking came from a general dissatisfaction with contemporary dress, male and female, from an aesthetic and artistic point of view. I wanted to see flowing garments and, except for tailored business suits, female attire was typically form hugging, with the exception of a few skirts. There came a wish to improve on the former painting by trying to design a draped garment that was based on the Greek tradition but which was something a person could wear now without appearing to have just come from a costume party. So I bought first some cheap fabric and started trying to sew. I had an idea for what I wanted to see but it proved beyond my very limited knowledge of sewing, so I sought out costumers and seamstresses. Another difficulty was finding the right model. Several months passed before any progress was made, though I did find encouragement. One day I saw in the park across the street four Indian women wearing saris, two young ones in pale green and two matrons wearing white. They were walking across a large lawn and the flow of the drapery was lovely. The young ones were nonchalantly tossing the fabric over their left arm, unconsciously, playfully. The elder ladies walked with a dignity of bearing, very feminine and beautiful, though more stout of form. One of the reasons for wanting to create and depict a draped dress was this very purpose. There is such a preoccupation with being and staying thin, yet these women in saris were lovely and womanly just as they were. This brief vision gave me a poetic surge to continue toward the project, feeling sure it was the right track. I wasn’t getting very far with the garment but one day in the autumn I saw the model I wanted to use, setting tables for an event in Davenport Hotel lobby. By this time it had become clear to me that it should be a lady in an evening gown, not a street dress, if I wanted to “get away with” this drapery idea. 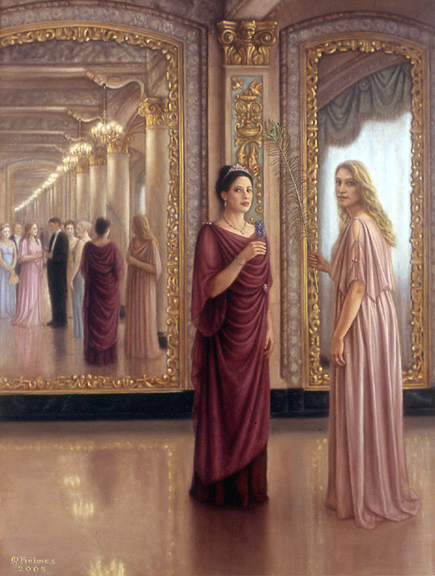 And this had merged with another ambition of mine: to paint an elegant lady in the setting of the Davenport, and I now knew exactly where I wanted it to be: in the Isabella Ballroom with it’s reflecting mirrors at either end. I also knew I wanted one with a beautiful but out of the ordinary face and Becky was perfect. It took a bit of inquiry to trace her down but when I had, and she she agreed, we began taking photographs for the figure’s placement. A lot of photographs! It soon became clear that to get the architecture of the room that I wanted, with the mirrors, there would have to be another figure. There had to be a logic to why she was standing there, in an elegant ballroom, and it wasn’t to be admiring herself in the mirror. I must spare the reader more details of the process. It ended up being over 4 years before I called the painting done. And 4 seamstresses. My other model, Mary, came along after I was sure that there needed to be two women interrupted in conversation. Having abandoned the first dress as hopeless, I went to another dressmaker who started over and came up with the transverse folds. This proved a godsend because I was soon had two gowns and two models. Or, well, not exactly. The figure on the right, Becky, is wearing the garment that was my original idea. That gown, however, still does not physically exist and what is seen in the painting was patched together from one that was constructed with some poor direction on my part. What there is does not fit Becky! The wine colored gown does and was made for her. The other one fits Mary! 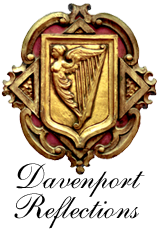 Though the owners of the Davenport bought the painting as soon as they saw it, the one gown, which with a little more work could possibly be worn in public, has not been. The painting exists but not the new fashion.